Nujiang Prefecture includes 2 counties: Lushui (lú shuǐ xiàn 泸水县) and Fugong (fú gòng xiàn 福贡县), 2 autonomous counties: Gongshan Dulong and Nu Autonomous County (gòng shān dú lóng zú nù zú zì zhì xiàn 贡山独龙族怒族自治县), Lanping Bai and Primi Autonomous County (lán píng bái zú pǔ mǐ zú zì zhì xiàn 兰坪白族普米族自治县). Yunnan, especially the western part, is an important cultural source of ancient China, and Nujiang Prefecture was the hometown of many primitive tribes. Along with many regions in Yunnan, this area was brought under the administration of the central government in the Western Han Dynasty (206BC-24AD), and was later governed by Nanzhao (738-937) (nán zhào 南诏) and Dali (937-1253) (dà lǐ 大理) states during the Tang and Song dynasties. Nujiang Lisu Autonomous Region was established in 1954 and changed to a prefecture three years later. Enjoying a plateau monsoon climate at low altitude, Nujiang is characterized by clear dry and wet seasons, great temperature difference between day and night and small temperature difference during the whole year. Due to the landform and altitude, it is colder in its northern part and warmer in the south. September is the best time to visit here, just after the rainy season. Nujiang is the only autonomous prefecture for Lisu ethnic minority. Nu and Dulong are minority groups unique to this region. 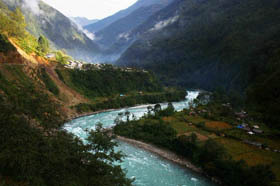 Lanping Bai and Primi Autonomous County is the main community of Primi (pǔ mǐ zú 普米族). People of ethnic minorities still maintain their traditional culture and customs. Nujiang people are followers of Protestant, Catholic, Tibetan Buddhist, and animist religions. There are numerous Catholic churches in this area as a result of the French missionaries who arrived here in the 19th century．A French priest named Pere Annet Genestier built the Catholic Church in Zhongding Village (zhòng dīng cūn 重丁村) along with a few others during the 1920s and 1930s. Lying in the longitudinal valley area of Hengduan Mountains (héng duàn shān mài 横断山脉) in western Yunnan, Nujiang is made up of lofty mountains and roaring rivers, with more than forty peaks in the prefecture over 4,000 meters high. Its terrain generally slopes downward from north to south. 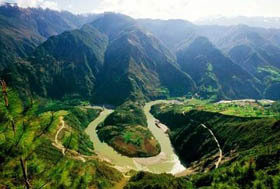 Other than a small area of flat land on the fringe, Lancang River (lán cāng jiāng 澜沧江) and Dulong River (dú lóng jiāng 独龙江), mountainous regions constitute the main part of the area. Three rivers, the Nujiang, the Lancang, and the Dulong traverse the prefecture, which causes many difficulties in the construction of transportation systems. 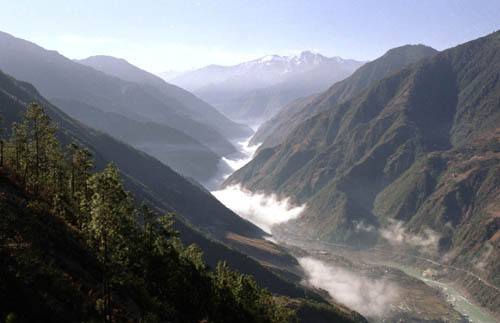 However, the layout of the rivers also creates a unique landscape, especially in the areas of Gaoligong Mountain (gāo lí gòng shān 高黎贡山), Biluo Snow Mountain (bì luó xuě shān 碧罗雪山), Dandanglika Mountain (dān dāng lì kǎ shān 担当力卡山) and around the Yunling Mountain (yún lǐng 云岭) range. The extremely varied elevation of the geography causes blazing heat at the lower elevations near the river banks, warmer temperatures half way up the mountain and frigid temperatures on the mountaintops. In Nujiang, there are vast primeval forests, producing numerous valuable forest products and rare Chinese herbal medicines. Among the magical gorges formed by the rivers, Nu River Gorges is the most spectacular. The part of the gorge in Yunan is over 600 kilometers (373 miles) long. With picturesque lofty mountains, virgin forests, river rapids and snowscape in spring and winter, the gorge is the most breathtaking example in the world. The Stone Moon (shí yuè liàng 石月亮) is another spectacle in the gorge. It sits on a rocky peak of Gaoligong Mountain. Looking from a distance from the highway, visitors can see a clear moon hanging in the sky. Actually, it is an elliptic rock hole about 100 meters (328 feet) high on a mountain peak. 600 meters (656 yards) from Fengxue Yakou (fēng xuě yā kǒu 风雪垭口) (mountain mouth of wind and snow) stands the magical Tingming Lake (tīng mìng hú 听命湖). When people speak around the lake, it will rain or hail. 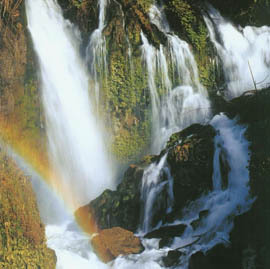 The Dulong Gorge is regarded as a natural museum of wild plants. 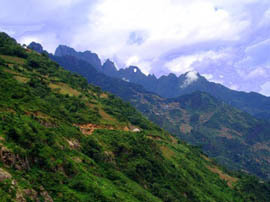 It is located in the boundary area between northwestern Yunnan and Burma with the Gaoligong Mountain on the eastern bank. This little-known gorge is completely isolated from the outside world when snow blocks the way from October to May. 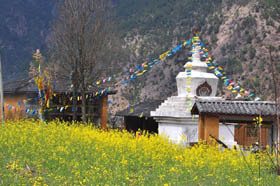 Bingzhongluo (bǐng zhōng luò 丙中洛) is a township on the border of Gongshan Autonomous County and Tibet. It is spoken of as the Shangri-La of Nujiang Prefecture. Nu, Tibetan and Dulong ethnic minorities live there. Primitive religions, Lamaism and Christianity coexist among those minorities. Traveling down along the river from Liuku (liù kù 六库) to Bingzhongluo Village in Gongshan, you will enjoy the scenery of the beautiful, strange, and tranquil mountains, the gushing river, the cable car, the suspending bridge, the cement bridge, the fascinating Stone Moon , Nujiang Bay (nù jiāng dì yī wān 怒江第一湾) and the Stone Guard (shí mén guān 石门关). In addition, the Qingshan Park (qīng shān gōng yuán 青山公园) in Liuku and the Dandang Park (dān dāng gōng yuán 担当公园) in Gongshan will both increase your enjoyment of this area. After your trip in Nujiang, you will find that the pure natural sceneries and unsophisticated folks make Nujiang a place which is in the middle of nowhere, at the center of everything. Travel Tips: there are three main routes to Nujiang. Visitors can take buses from Kunming directly to Liuku Town or Gongshan County of Nujiang. Regular buses are available from Kunming Passenger Transportation Bus Station at the south end of Beijing Lu, neighboring Nanyao Railway Station. Liuku is about 581 kilometers (361 miles) from Kunming. The whole journey takes 13 hours. Visitors can get to Baoshan and Dali by air first, and then change to buses to Liuku. Dali is about eight hours' drive to Liuku, and four hours from Baoshan. Special Local Products: braided rug of Dulong ethnic minority, sumac, herbs, marble.